An Arrow Cloud in Yoshi's Island DS. An Arrow Cloud is an object appearing in Super Mario World 2: Yoshi's Island, Yoshi's Island: Super Mario Advance 3, Yoshi's Island DS, and Yoshi's New Island. Arrow Clouds can be found in numerous levels of the games they appear in. 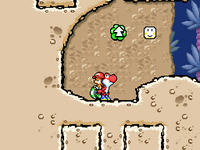 If hit with a Yoshi Egg, the Arrow Cloud sends it flying in the direction the arrow is pointing. There are two types of Arrow Clouds: those with arrows fixed in one direction, and those that rotate constantly. On levels such as Baby Mario and Baby Peach: Dynamic Duo, Arrow Clouds may be used in puzzles. ...and eventually one of the level's Flowers. This page was last edited on December 6, 2018, at 14:03.